Q&A With Thomas Locke: Will ‘Emissary’ be made into a movie? Q: Do you foresee the books in The Legends of the Realm series being made into major motion pictures? Thomas Locke: Two weeks after signing the book contracts, I received word that a UK film company had decided to acquire film rights to Emissary. I desperately wanted to write the script, but for a project of this size there was nothing I could say that might influence the producers. So I wrote the first act and sent it to them just before Christmas, 2013. I was contracted to write the screenplay in January 2014. When I returned to the UK in July to teach at the Oxford-Cambridge summer conference, I met with the producer and director to go over the revision process. The next step is making an initial presentation to prospective investors. It’s difficult to predict the timing of when a film will begin production, because decisions must be made about who will play the starring role. Funding often hinges on who the star is, and the star’s availability determines when the film begins production. A lot of work is going on behind the scenes, and I’ll keep you posted as things unfold. Will EMISSARY by Thomas Locke be made into a movie? Will there be a sequel to EMISSARY? Is EMISSARY modeled after specific situations? What’s your favorite quote from EMISSARY? Describe your creative process in inventing three races? Have you ever owned a wolfhound? Is EMISSARY a David vs. Goliath story? Why is the protagonist in EMISSARY named Hyam? Does EMISSARY make political statements? How do you hope to encourage EMISSARY readers? What is “epic fantasy for modern readers”? I’m excited to announce the launch of my new website, TLocke.com. About a year ago, we kicked off the new Thomas Locke brand with a one-page website. At that time, the site focused on my first epic fantasy novel, Emissary. On August 4, Trial Run (the first book in my Fault Lines techno-thriller series), will release. We redesigned the one-page site and expanded it to a full-featured site that will accommodate the release of several upcoming books. I’m thrilled with the work done by my online marketing manager Laura Christianson and her team at Blogging Bistro. I know that authors are supposed to stay laid back and above the fray, but I want to jump up and down when I look at my new site. Take a look around and leave a comment. I’ll draw a winner from among all the comments and send the winner a copy of Trial Run as soon as it’s published. Hope you’ll sign up for my e-mail list while you’re exploring the site. You’ll be the first to receive announcements about giveaways, upcoming books, and will also get my latest blog post in your Inbox. P.S. Winners will be announced on my blog and notified via email on Wednesday, June 24, 2015. I just learned that Emissary is #5 on the June 2015 CBA best-seller list for fantasy/sci-fi.The CBA best-seller list for June is based on sales through April 30. Wow! I can’t tell you how thrilled I am about this. Writing in two new-to-me genres (fantasy and techno-thrillers for the mainstream market) has been something I’ve long hoped to do. I’m so grateful to you for having enough faith in my writing to explore these new genres along with me. Q&A With Thomas Locke: Will there be a sequel to ‘Emissary’? Q: Emissary is book 1 in the Legends of the Realm series. What’s coming next, and when will it be available? 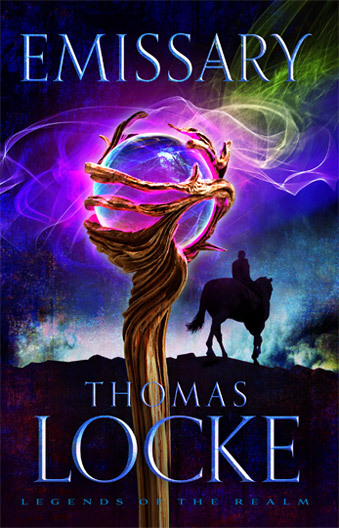 Thomas Locke: I finished the first draft of book 2, The Merchant of Alyss, in October 2014. That book comes out in January 2016. I have developed story concepts and a thematic structure for book 3, but I’ll sit on it for a few months before I start writing. Book 3 comes out in January 2017. Q: Can you give us a “teaser” about what we can look forward to in book 2? TL: In Emissary (book 1), I feel as if I was coming to terms with this new direction my writing is taking and answering a lot of questions about who I am as a writer of mainstream fantasy. I believe e Merchant of Alyss is a major step forward. It’s kind of like the movement from The Hobbit to The Lord of the Rings. A massive undertaking begins in book 2. It’s a huge story. The structure of the characters is much deeper, and the challenges they face – internally and externally – are much more pronounced. Book 2 has more of an “epic” feel to me. I love that readers of Emissary aren’t shy about sharing their strong opinions about the story, for better or for worse. Today, we have excerpts from four reviews of Emissary from Lindsay Franklin, Matthew Sundin, Deborah Wilson, and Keith Hazard. Please click the link next to each person’s name to read their full review. Emissary is the story of a young man named Hyam who discovers he possesses crazy magic ability that may just save the realm. It sounds like a fairly well-worn story line–and it is–but there are plenty of good world-building bits and interesting characters here to keep even the jaded fantasy readers happy. 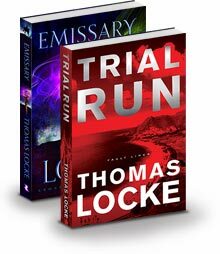 Emissary is the first Thomas Locke book I’ve read, so I’m not familiar with his usual voice. But this story is written in a mid-century style that caused pleasant nostalgia to bubble up whenever I snagged a few moments to read. Think Tolkien and Lewis. I hesitate to say that, since it’s a bit cliche, but let’s be real. What fantasy novelist doesn’t enjoy those comparisons? I mean it as a compliment, since Locke pulls it off with ease…and doesn’t sound like a wannabe. The first quarter of the book left me a little undecided. The story was ethereal, and reading it felt a bit like grasping at wispy strands of different medieval fantasy elements, though not quite a cohesive whole. Not unpleasantly so, but I did have trouble grabbing hold of the plot and acclimating myself to the complicated story world and magic system. However, the story really became grounded about halfway through. At that point, I didn’t want to put it down. The ending was satisfying but left me hanging, too. A good thing, since this is the first in a series. I’m definitely interested in reading the next installment. Bottom Line: Fans of fantasy, Christian or secular, should give this one a read. A slow starter but rewarding if you stick with it. Emissary, a Fantasy/Adventure, coming-of-age story by Thomas Locke, follows the adventures of a 21-year-old man named Hyam. After a traumatic youth and his mother’s death, Hyam is sent to visit the mythical and mysterious Ashanta race to deliver grave news. During his time there, he is asked (or forced) to become the emissary for the Ashanta people, to inform their allies and to be there on their behalf. Along his journey he endures trials, recruits allies of his own, struggles with his heritage and discovers a power he can barely even fathom. The story is well written and very enthralling. The story following Hyam leaves you with a sense of wonder, but has enough realistic properties that it does not become insanity. Though the story is meant for a younger audience, members of an older audience could still find enjoyment in reading this book. Through and through, Emissary is a great story and a good read. I recommend this story to lovers of adventure and fantasy. 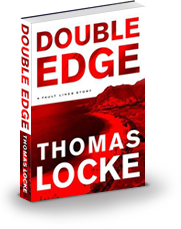 Although fantasy is not generally my genre of choice, when the opportunity to read a Thomas Locke novel presented itself, I leapt at the chance. Locke did not disappoint. I was irresistibility drawn into a fantasy world of wizards, exploits and magic which so paralleled the adventures, challenges and emotions of real-life, it seemed quite plausible. Upon turning twenty-one, Hyam, begins to sense some newfound abilities. Not yet sure of how to handle his ‘gifts,’ he is nonetheless thrust into a quest through a rugged and dangerous realm to fight off the approach of impending evil. Subsequently he is joined by others, including a wise and learned ally, and Joelle, a young woman with some gifts of her own. Locke’s main storyline is filled with precarious situations, impending disaster and warfare. However, he interjects aspects of delight, sorrow, wisdom, hope and romance, together with several unexpected twists. While this book is not Christian in any way, a call to a life of fearlessness and noble endeavors is interwoven throughout its pages. I found my mind occupied with the plot even when required to set the book aside for the realities of life, such as fixing meals, work, etc. I wait with anticipation for Book 2 in the Legends of the Realm series, coming in January 2016. Thomas Locke would be invited to be an Inkling with C.S. Lewis, J.R.R Tolkien Owen Barfield, Charles Williams and friends if he lived in Oxford 80 years ago. He has the instantaneous stature of Lewis and Tolkien with his inevitably to-be-a-classic Emissary. It is an amazing creation for a first-time attempt at classical literary fantasy. He reaches well beyond Thomas Covenant, the only recent contender for an Inkling mantle. His perfect balance of character and action, depth and broad sweep, nuance and scope is stunning. I look forward avidly to the sequels. Q&A With Thomas Locke: Is ‘Emissary’ modeled after specific situations? In about half the stories I write, there is a specific instance on which I model the story structure. But not in the case of Emissary. One morning, it just sort of arrived. I had a sense of walking into a full-blown concept of what I wanted to do. There’s one scene in particular where I felt like I could see it playing out. It’s the scene early in the story where Hyam enters the Ashanta settlement and his childhood friend, Brenna is waiting. I won’t tell you more because it’d be a plot spoiler, but you’ll recognize the scene when you read it. Here are excerpts from 10 reviews written by avid fans of fantasy literature. And fantasy readers are a tough crowd! Please click the link to read the full review. Live it, BREATHE it. Smell the scent of this new world, and be captivated by Thomas Locke’s intriguing interlocking style of family, fear, frenzy and futuristic felicity. Get it. Read it. And let it read you. Roam the hills and search for allies with this likable protagonist. These characters live and breath with a luminous reality. wow. I have all too often come across a sci-fi that thinks it can rely on stale relics of magic/demon/war paint/maidens and float it on a spaceship of ideas that fail to claim the reader, end like a teaser, and inspect an unknown world with such a foggy lens that the author must have finished just as muddled as he/she began. That’s not my thing…. I AM SPEAKING OF WHAT THIS BOOK IS NOT. I want you to know, this book supplies the exact OPPOSITE. There is a fresh face to sci-fi with Thomas Locke on the job! A hunting expedition that earns the endearment of a fawn family. (go figure) A secret sect crafting a warhorse from a child (or, are they?). Who to trust? who to flee? Chills. Skills. Arrows. Powers. Glowers. You get it all. You aren’t “spoon fed” or “neglected” as the reader. You just don’t exist. And neither do the pages. The words fly with a power of their own. They live. And, I promise, “the ending” doesn’t kill your desire for more. You know as well as I do that Thomas Locke is the best when it comes to spinning a yarn. (if you don’t yet know that.. well, you will) His stories are like a tapestry that has all of it’s threads in order. The reader won’t have to knot the loose ends at the finish. Fantasy has always been one of my favorite genres. Emissary, by Thomas Locke, has shot to the top of my list of favorites. Clean, crisp writing paired with descriptions that pull you into the environment make this a very enjoyable novel. The story so enthralled me that I dreamt about Hyam’s adventures and woke myself up—only to read to the wee hours until I had finished. As I loved Hyam and Trace and Joelle, I am delighted to tell you this is merely the start of the adventures. Emissary stands by itself, though, with a beginning and a conclusion—unlike many series that leave you hanging. As someone who is very picky about fantasy novels, I found Emissary to be a great addition to my fantasy shelf. The dialogue is quick, even explanations are left blunt and to the point, which works very well for this book. The only time I had a struggle with the fast-paced nature was in the beginning. Because Locke leads in with no explanation (relying on the idea that the reader should learn as he or she continues), the intro of Hyam is a little jarring. I am not sure that the seasoned fantasy reader will find this book more than just a prequel of better things to come. I believe the book should be classified a young adult fantasy as opposed to a fantasy for grown-ups. The action is mild and the evil while being terrible is not looked into in any amount of depth to instill fear. I found there to be a great deal of wonderful build up to an ultimate conflict, but the actual conflict was resolved rapidly. The story did leave plenty of questions unanswered and had lots of innuendo of events to come in the next book. This was a pleasant read with no foul language and no explicit gory violence. Thomas Locke replied, “My first passion as a young reader was science fiction and fantasy. When I started writing at age twenty-eight, my first mentor was Arthur C Clarke. But it was not until two years ago that I finally felt that singular urge to turn from my ‘tried and true’ creative directions and take this on. Leading up to this point, I had become increasingly frustrated by the constant negative directions that both fantasy and science fiction were taking. The hopelessness, the undead—many of these stories I devoured. But did they all have to be tainted by this same darkness? Was there no place any more for the same sort of heroic adventure that so thrilled me as a youngster? Emissary shows the imaginative side of this author. This novel is filled with creativity, wonderment and suspense. I look forward to the next book in this series. This would make a good book club pick and a great escape. I highly recommend it. As a long-time reader of fantasy fiction, it is refreshing to find a story that doesn’t apologize for being fantasy or for unfamiliar geography and time through long-winded descriptions that distract the reader from the main flow of the story. That being said, the graceful flow and development of the characters carries the reader along and reveals the background in a natural way that obviates the need for all of that extra supporting information. Much as in an actual relationship, you get to know the characters and settings in a more natural way. The way Locke weaves the story puts him at the forefront amongst the great writers of fantasy. After said project was finished, I again picked up Emissary and re-read it — and enjoyed it far more that second time through. I have read quite a bit of fantasy fiction — with Brandon Sanderson as my epic standard — so there were certain things I was looking for in this first fantasy book by Thomas Locke. I have also read numerous books by this author in other genres and always loved how amazingly he develops his characters and plot. Those talents are definitely still very evident in Emissary. The only area that seemed a bit less strong to me was the development of the world in which Hyam lives. The more I thought about it, though, I realized that I had a similar response after reading the first Harry Potter book. It was really good, but compared to later books in the series, as I would find out, it just wasn’t quite as strong. I think that’s why I enjoyed Emissary so much more the second time through. I was not rushed, and I already had an understanding of the world in which it occurred, so I was better able to enjoy the well-developed storyline. Locke has laid an excellent foundation for his Legends of the Realm series and I am very much looking forward to reading the other two when they come out! There is a new name in the fantasy genre. It’s Locke: Thomas Locke. Move over, Martin and Rothfuss. 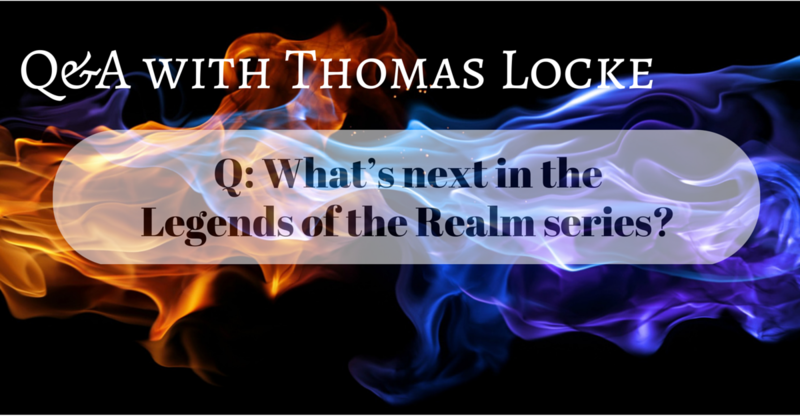 Thomas Locke is the new up and coming fantasy writer. He crafts a beautiful story, and his characters are well developed. Hyam and Joelle’s characters come to life in this tale of good versus evil, centered around a quest for truth. I enjoy a fantasy novel that includes at least one hero who grows through meeting challenges, where there is conflict between good and evil and good wins at a great price. Of course, a little romance can’t hurt. The hero and emissary of the title learns after the death of his parents that his origins are different than what he had believed and he begins a search for his true history while discovering powers he didn’t know he possessed. There is also a parallel story of a young woman on a similar quest. They both grow and become powerful allies against the enemy. Most questions are answered by the end of this story providing enough closure for now. The unresolved questions set the scene for a sequel. I am a big fan of fantasy books and was excited to start a new series. From the beginning, the story sucked you in and kept you interested for the duration of the book. The characters were wholesome with admirable qualities that made you identify with them and wish for their success. 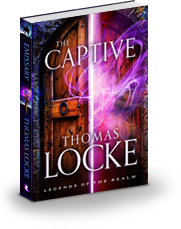 The many plot twists kept the reader guessing and the fantasy world that Thomas Locke created was believable and well thought out. The history of the various people and realms could have been more completely explained to fill in some of the gaps but that wasn’t necessarily crucial to the story but rather of a personal interest to the reader. I would strongly recommend this book to readers that enjoy fantasy. Q&A With Thomas Locke: Do you have a favorite quote from Emissary? One issue Hyam (the male protagonist) faces is that he doesn’t fit in. From the beginning – in the first few pages of the book – Hyam is forced to accept that that his father is not his father, his mother is not his mother and he’s not fully human. He’s placed on a road that’s not of his choosing. A women who’s been the bane of his existence since he was a child tells him that war is coming, and that his personal feelings are not important. Hyam has a choice to make: he can either dwell on the unfairness of life or he can use the amazing abilities he has and move beyond who he thinks he is and who society expects him to become. If he accepts this quest, he can never go home again. Good news, friends. My publisher, Revell, has extended the ebook deal on Emissary through April 30, 2015. Emissary is book 1 in the Legends of the Realm epic fantasy series.